Looking for a cost effective, yet low maintenance and flexible Housing and Accommodation Management system? Mercury Cloud Core delivers rich and robust dynamic functionality, customizable branding to match your institutional styles, and includes integration with your student information and finance systems. When our team arrives on campus they will deliver all of the necessary training to ensure your success. Mercury Core supplies all of this at an affordable price point to fit every budget, without the need for an RFP process.Mercury Core provides online applications, self-assign, auto allocations and so much more to make your organization more efficient while delivering an exceptional student and staff experience. 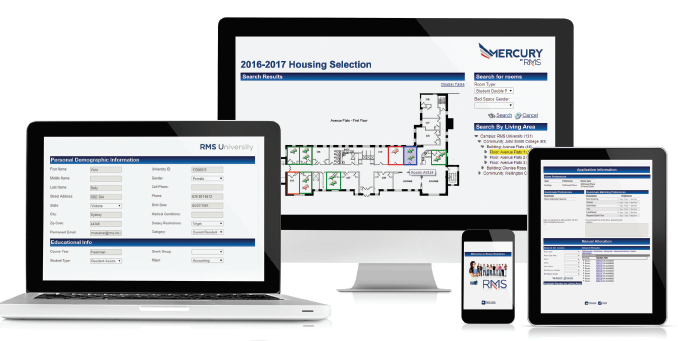 Staff tools to effectively manage your Residence Life and Housing organization such as auto allocation, drag and drop reporting, room changes, program and incident management, contracting, profile management, damage billing and so much more.